Štadión pod Dubňom is the home ground of MŠK Žilina, and is currently one of three football stadiums used by the Slovakian National Team. 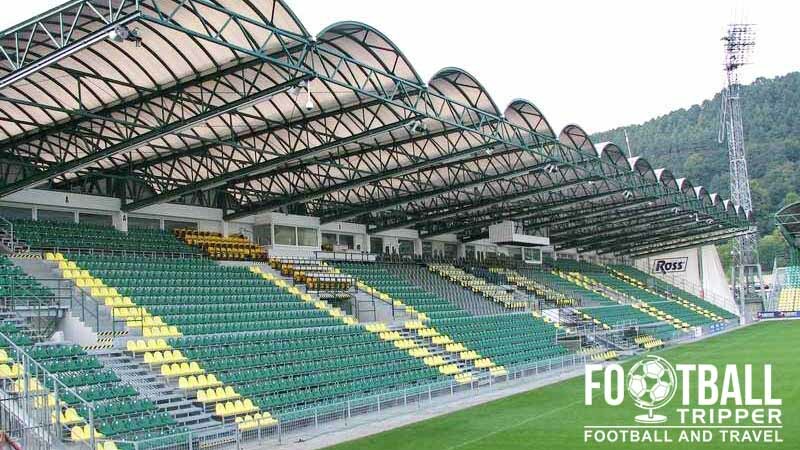 Situated in Žilina which is the fourth largest city in Slovakia, the ground is capable of accommodating just over 11,000 supporters. The site on which today’s Štadión pod Dubňom sits has been used to host football matches more or less since MŠK Žilina’s formation back in 1908. It wasn’t until 1941 however that the first stands were erected, and the plot of land had enough permanent facilities to begin being regarded as a proper football stadium. Štadión pod Dubňom’s name is derived from its location close to the Dubeň Hill which sits to the north of the stadium just across the river Váh. 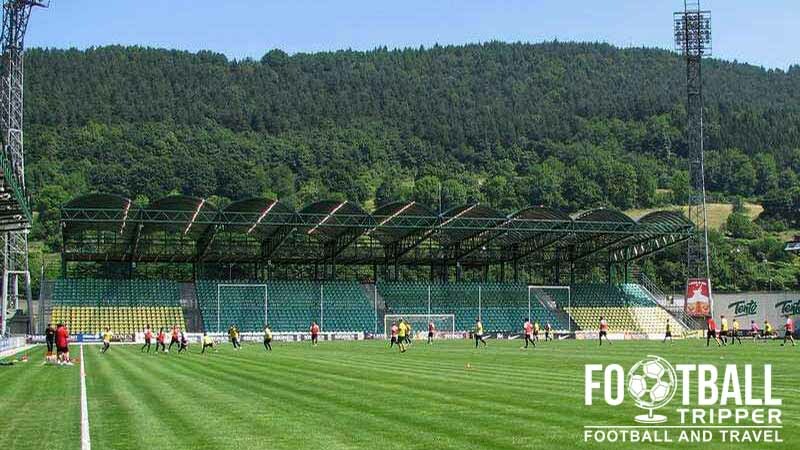 It literally translates into English as “Stadium under Dubeň Hill”, and views of the roving hills can be seen from inside the ground with the exception of the northern goal-end stand. At the turn of the millennium Štadión pod Dubňom underwent large scale renovation work in order to bring it into the 21st century. Beginning in 2002, modernisation was achieved across a seven year period with the east stand being the last section of the stadium to be rebuilt just in time for the start of the 2009/2010 season. Redeveloped in stages in order to minimise disruption, temporary stands were erected behind each goal as work was slowly carried out across each side of the pitch. Upon completion Futbalový štadión MŠK Žilina was awarded three stars by UEFA. The highest level of club football hosted at the ground undoubtedly game during the 2010/2011 season when MŠK Žilina reached the group stages of the Champions League. They were drawn into a group containing Chelsea, Marseille and Spartak Moscow but unfortunately finished last. Štadión pod Dubňom is comprised of four separate stands: North, East, South and West. Futbalový štadión MŠK Žilina is a rectangular shaped stadium, very much built in the mould of traditional English Grounds with its four separate stands. Equivalent in size to a League One or League Two ground, the relatively small arena has an intimate feeling to it, and a passionate atmosphere. 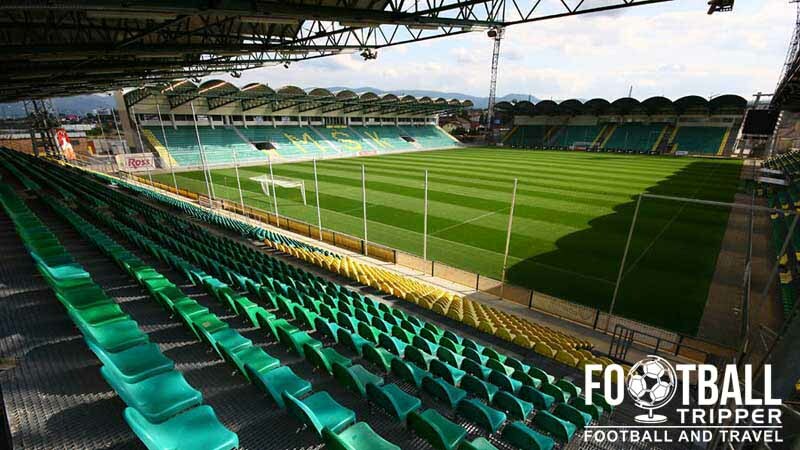 Situated within the fourth largest city in Slovakia, the stadium may not be the largest in the country but it’s arguably the best on offer. Adhering to UEFA regulations, it was a natural choice to host International games at the venue. One of the largest ultras group are the North Brigade. Needless to say they were not too pleased when the club announced plans to house away fans in the north stand a few years ago! Away fans are housed within Block D of the North Stand which is capable of accommodating 596 fans per match – the standard ticket allocation for the visiting team. The turnstiles at the end of the underpass are accessible from Ľavobrežná street. With an excellent city location there’s a lot of drinking to be had in the city centre before and after the match. Fans can purchase official merchandise from MSK Zilina’s Online Store in addition to the various sellers around the ground on matchdays. It doesn’t appear as if there are any stadium tours available of the facilities at Štadión pod Dubňom. 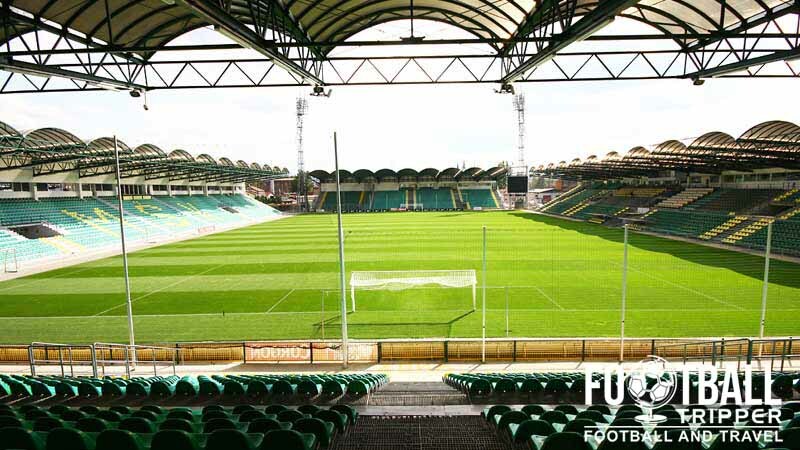 Tickets to see MŠK Žilina in action at Stadion pod Dubnom can either be purchased online or in person at the box office on the south-east corner (Uhoľnej stret) either on the days leading up to the match or for up to four hours before kick-off on matchday. Futbalový štadión MŠK Žilina sits on the southern bank of the Váh River next to the city’s main railway station, approximately 1.3 km north of the historic city centre. The prime urban location means that the average football fan can easily walk to the ground within 15-20 minutes from central Žilina. The car park behind the eastern stand is reserved for those in possession of parking passes, whereas the north one is available for guests on a first come first serve basis. Žilina railway station is well connected to the rest of Slovakia with direct services to Bratislava and Košice. The station also sits on a Pan-European Corridor route between Venice and Kiev which means the city is well connected to the rest of Europe. Štadión pod Dubňom is literally next door to the station and can be walked to in two minutes. Upon exiting turn right onto Pavla Országha Hviezdoslava, and then right again Kysucká followed by a final right onto Uhoľná to reach the southern end of the stadium. The entrance of the main railway station of Zilina. In Slovak it is referred to as Železničná stanica Žilina. Although it’s unlikely that you will need to catch a bus, the station on Kysucká 2 minutes west of the stadium is served by numerous buses including: 21, 22, 27, 29 and 30. There are also plenty of other bus services which can take you to “Železničná stanica” which is the bus stop outside the station. The local airport in Žilina is small and is no longer served by regular International flights which means the nearest airports are either the one in Bratislava (161 km) or Ostrava in the Czech Republic (114 km). From Bratislava, the capital city of Slovakia, you can travel to Žilina by train in just over 90 minutes. As Štadión pod Dubňom is right next to the train station there are plenty of accommodation options within a five minute walking distance. The Three closest are the Holiday In Zilina, Hotel Slovan and Best Western Plus. For those on a budget Hotel Slovakia 15 minutes south of the stadium looks like a decent shout.